In Trianta Bay, Kremasti, enjoy the retreat in the immaculate 5 Star Amathus Beach Hotel Rhodes on your holiday in Greece. Located near the sea, the hotel enjoys a gently sloping sandy beach. Guests can take a refreshing dip at the outdoor pool. The terrace, the balcony, the garden and the sun terrace invite you to soak up the sun. 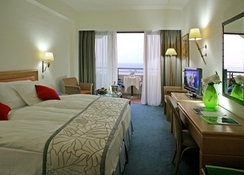 Guests can choose from a total of 333 rooms. The rooms are spread over 11 floors and an elevator service will take you to your room. Public transport (200 meters) can be found not far from the hotel. There are a lot of sport and leisure facilities at the hotel, combined with a state-of-the-art gym and sauna. 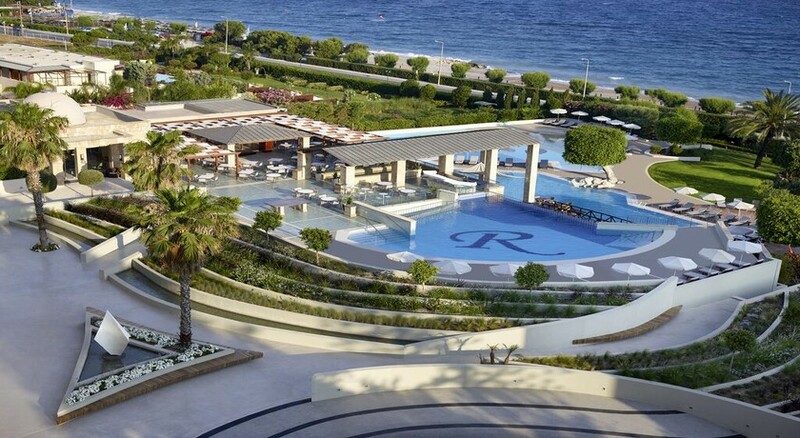 Of course, wireless Internet access is available at this stunning Amathus Beach Resort hotel in Rhodes. This elegant luxury hotel is set amidst lush greenery on a hill above the sandy and pebble beach of Ixia, which is directly accessible via an underpass on the shore road (about 200 meters from the hotel). The island capital of Rhodes is about 4 km away. The Rhodes airport is approximately 9 km from the hotel. Public transport can be reached at a distance of about 200 meters. A spacious living room and a stylish lounge, a balcony and much more is what your ocean view room at Amathus Beach Hotel Rhodes offers. The bathroom has a luxurious spa bath, a large bath and a shower. Amenities in the bathroom include a hair dryer, a fluffy bathrobe and comfortable slippers are at your disposal. A comfortable extra bed, a cot or a space-saving sofa bed is available on request. Room amenities include a flat-screen TV with DVD player and a CD player, a telephone, an in-room safe and a well-stocked minibar. Watch live cooking shows as the chefs create magic whipping up traditional Greek and international delicacies at the hotel. There is a restaurant and a café in Greece for this purpose. In the restaurant there is a non-smoking area. 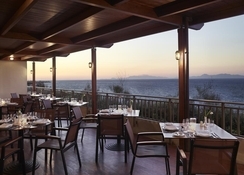 The kitchen team will spoil you with culinary delights at Amathus Beach Hotel Rhodes, including a buffet breakfast, lunch buffet, lunch menu, evening buffet and evening menu. The snack bar offers a rich selection of small dishes for in between meals. Treat yourself to pure relaxation in the hot sauna during your stay. Pamper yourself at the soothing steam bath, the luxurious whirlpool, the healing Thalasso, the Turkish Hammam or the weather-protected indoor pool. The spa experts at Amathus Beach Hotel Rhodes will spoil you with massages. A beauty salon and hairdresser is also available. At Amathus Beach Hotel Rhodes there are a variety of ways to power up. For example, the offer includes tennis. On the beach, the offer includes water sports, surfing, windsurfing, jet skiing, diving, sailing, pedal boating and canoeing. In addition, there is table tennis. 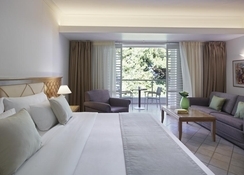 The hotel is located near the gently sloping sandy beach in Greece and promises boisterous fun in the great outdoors. The weather-protected indoor pool ensures that you can enjoy swimming in all weather. For the perfect day at the beach, you will find comfortable sun loungers, parasols and towels. For refreshing snacks, the pool bar awaits you with cool drinks. Thanks to the varied entertainment program your holiday will certainly be entertaining. It was a nice hotel good location just needed a refurb in some places as it was tacky in some places.